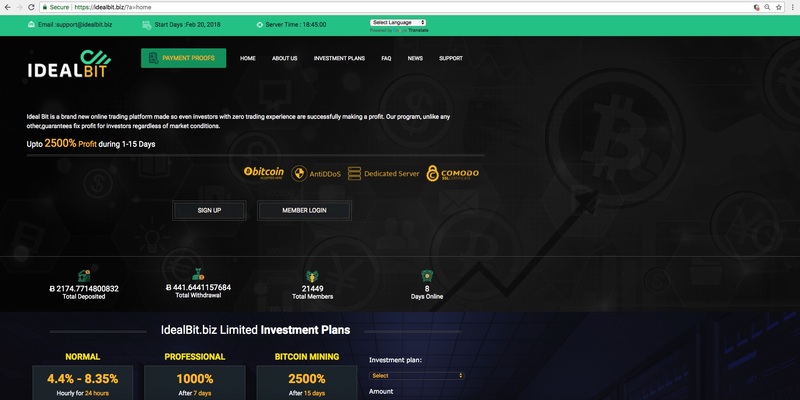 IdealBit (IdealBit.biz) is an online cryptocurrency investment platform that was created on February 11th, 2018 by IdealBit Ltd.
IdealBit advertises their operation as a straightforward investment platform for cryptocurrency investors. Those looking to invest Bitcoin into their platform can get started with 1 of their 3 investment plans where they can expect a lucrative ROI in return. IdealBit claims to be a representative of the international computer technologies market, active with Bitcoin encryption algorithms and mining along with a developer of hardware and safe investment opportunities. While IdealBit tries to flaunt their qualifications and credentials, the site falls drastically short of providing information regarding their asserted resume. No information regarding mining hardware or encryption algorithms are detailed nor is there any insight given in regards to their investing which is what this platform is truly all about. IdealBit tries to establish credibility early on out of the starting blocks by providing their UK based corporate information. According to their domain, they are owned and operated by a corporation known as IdealBit Ltd. As validated through CompaniesHouse, IdealBit is an active private limited company that was incorporated on February 12th, 2018. Reflecting a corporation number of 11201435 with a registered office address of 46 Brownfield Street Poplar, London, United Kingdom, E14 6NE, this corporation is allegedly directed by an entity known as Harley Simpson. As a map search will suggest, their alleged corporate address does not compute to an actual visitable location and if so appears like it would reside within the boonies. As we have mentioned time and time again, many illicit cryptocurrency ventures have been relying upon the easily fooled UK based business registries as their credibility crutch. Renting virtual addresses and aliases online, con-artists are able to create these illusive corporations with minimum backlash and affiliation. IdealBit possesses all of the characteristics and misconceptions that we are grown accustomed to encountering when dealing with unverified and scam like investment operations. While IdealBit portrays an impressive resume they fail to disclose crucial information to validate and back up those claims. In addition, there is no reference in regards to their employed mining hardware or how an investor funds are managed which leaves only their unbelievable high asserted returns. Furthermore, IdealBit is operated by an ill-founded UK based corporation known as IdealBit Ltd and reflects inaccurate registration information that cannot be overlooked. Given the lack of transparency and suspicious business practices, we do not believe IdealBit.biz to be a trustworthy and believe it is likely a Ponzi scheme. Please share your story or any insight you may have regarding IdealBit by leaving a comment below! I was using this site and they were paying daily until 3 days ago. They don’t respond to the emails and the phone number is fake , anyone reading this please do not invest you will lose your money.